Never a media darling like Einstein or Oppenheimer, Enrico Fermi (1901-1954) is now barely known to the public, but few scientists would deny that he was among the most brilliant physicists of his century. A lucid writer who has done his homework, Schwartz (NATO’s Nuclear Dilemma, 1983), whose father won a Nobel Prize in physics, delivers a thoroughly enjoyable, impressively researched account. 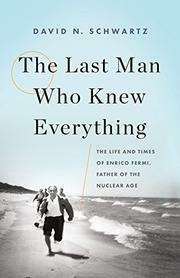 The son of a middle-class Italian family, Fermi was a prodigy. As an adolescent, he absorbed textbooks in physics and mathematics and obtained perfect grades in those subjects in college. After graduation, he led a team that made Italy, formerly a backwater, a world-class center of physics. In the decade after 1925, Fermi described the weak interaction, one of the four fundamental forces of nature, and perfected neutron bombardment of the atomic nucleus, which produced artificial radioactivity and ultimately nuclear fission and the atomic bomb. After winning the Nobel Prize in physics in 1938, he left Mussolini’s Italy for the United States, where his research indicated that neutrons from uranium fission would lead to a chain reaction releasing enormous energy. Proving this required an actual chain reaction, which he accomplished in 1942 after building the first atomic reactor. He led a section of the Manhattan project, which produced the atomic bomb, and remained a dominant figure until his premature death at 53. Einstein only theorized; Ernest Lawrence only built machines and experimented; Fermi excelled at both besides being a superb teacher universally loved by students. Neither eccentric nor introspective, he kept no diary, so little is known of his inner life, but Schwartz has no qualms about speculating. A rewarding, expert biography of a giant of the golden age of physics.